situated in picturesque Camps Bay surrounded by the Twelve Apostle Mountains, Table Mountain and the Atlantic Ocean on the other side.” Our Camps Bay guest house offers world-class facilities to ensure that you get the most from your accommodation experience at Azamare. 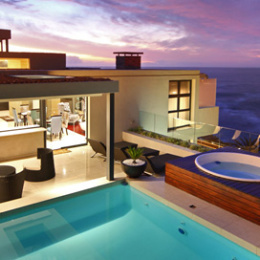 Enjoy sundowners, snacks and amazing views from the swimming pool, Jacuzzi or your own balcony. Take some time in our lounge area with uninterrupted sea views or snuggle up in winter in front of the modern gas fireplace with a glass of wine. A full English breakfast or a choice of 3 cereals, 2 different yoghurts, a selection of juice, tea and coffee, seasonal fruit platter, cold meat platter, cheese platter, Danish pastries, croissants, toast, muffins and or scones with preserves are served every morning between 08:00am and 10:00am in the dining area or on the balcony and pool area.